25 July 2018: A submission from Class Limited in response to the Productivity Commission’s enquiry into superannuation has highlighted – and filled in – some critical ‘SMSF gaps’ identified in the Commission’s draft Report. The Commission’s 571-page Report into Superannuation provides some well researched findings on APRA funds, but fails to hit the mark on SMSF performance. Class points out that this isn’t a reflection on the quality of the Commission’s work, however it is a stark reminder of the inherent differences between how APRA and ATO report fund performance. • The smaller the SMSF balance, the higher the impact of those extra costs. Class has completed its own analysis based on publicly available contribution tax and insurance data from the ATO, to restate SMSF performance so it can be directly compared to APRA fund returns. For the 10-year period the Commission’s Report covers, SMSFs outperformed APRA funds on a like-for-like basis. 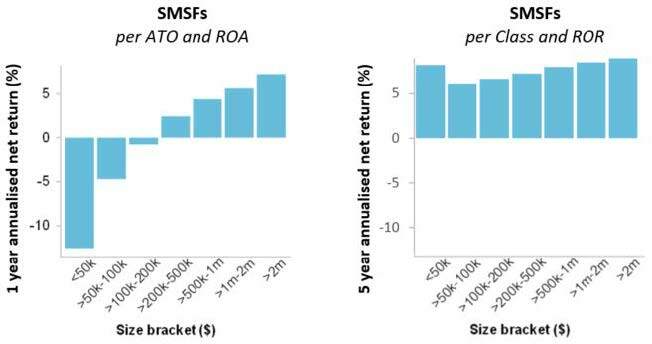 • The Class submission shows that when SMSF performance is restated using the APRA approach, the amount by which SMSFs outperform APRA funds is even higher (SMSFs 6.71% compared to APRA 5.58%). The Class submission also highlighted a second large discrepancy around performance reporting. The Report highlights how APRA funds, of different sizes, performed over the 10 years 2006-2015. In parallel, the Report should also show how SMSFs starting with different balances eg $1-50k, $51-100k, performed over the same 10-year period. Instead, they provided a mash-up of one-year performances across the 10 years. This is highly concerning, given that super is all about saving over the long term, and the industry should be able to compare this data on a like-for-like basis. 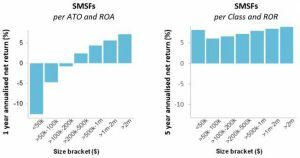 Class analysis of SMSF performance across 5 years shows that although funds with smaller balances do generate lower returns, the variance is considerably less than the exaggerated results provided in the draft Report. The Class analysis shown on the right-hand chart, used APRA’s ROR method and looked at SMSF performance over the 5 years 2013-2017. Funds were grouped by their starting balance in 2013. Long-term fund analysis published by the ATO in the infographic SMSFs first lodged in 2012 FY: where are they five years on? didn’t include performance data. Class would like to see the ATO provide a 10-year version of this document and that it should include performance for all SMSFs, grouped by their start of year balance in 2006. Class CEO, Kevin Bungard says: “It appears that the advice the Commission got from the regulators was that it is ‘too hard’ to compare the performance of APRA funds against SMSFs – which is disappointing, given the dual regulators are responsible for an industry worth over $2 trillion. The Class analysis highlights how significant the different approaches to performance reporting really are. A full copy of the Class submission can be downloaded here.